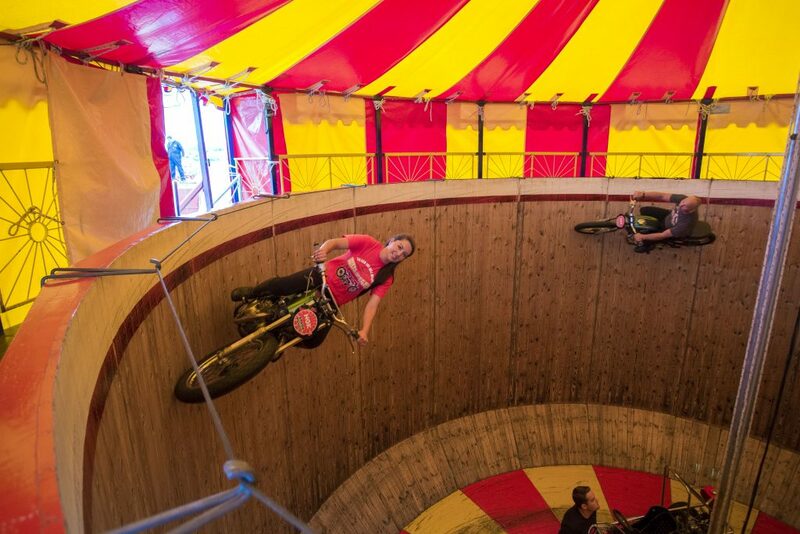 Meet the real Charlie’s Angels – the only three women in the UK to take on the vertigo-inducing wall of death. Glamorous girls, Kerri Cameron, Jaimi Starr and Abigail Fox perform the death-defying stunt as part of the Ken Fox troupe. 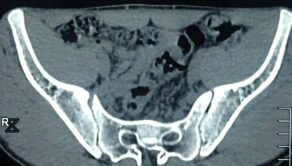 The fairground sideshow sees the brave trio regularly mount motorbikes and use nothing more than gravitational force to stop them plunging 20 foot down the vertical cylinder. Ken Fox is the founder of the troupe and is recognised as being the world’s leading rider on the Wall of Death and the only person ever to take a steam bike onto the wall. Bizarrely Kerri only became a stunt rider by accident when she thought she was applying for a job as a horse rider. Ken learnt to ride with Crispey’s Wall of Death in Skegness before building his own wall in 1995. The Wall itself is 20ft high and 32ft in diameter and made completely of Oregon Pine. Ken Fox, 28, said: “All of the men in the audience always tell the girls that they’ve got ‘bigger balls’ than they have. “The girls are so effortless about what they’re doing and are always willing to learn new tricks – they’re so happy to listen. “The idea came about because in the 1930’s there was a troupe called the ‘Blond Bombshell’ – and we thought it was time to reinstate that again. “It’s been a 15-year period of training the girls up, considering they couldn’t even ride motorbikes at the beginning. “They’re now confident enough to ride alone, and they work fantastically well together. 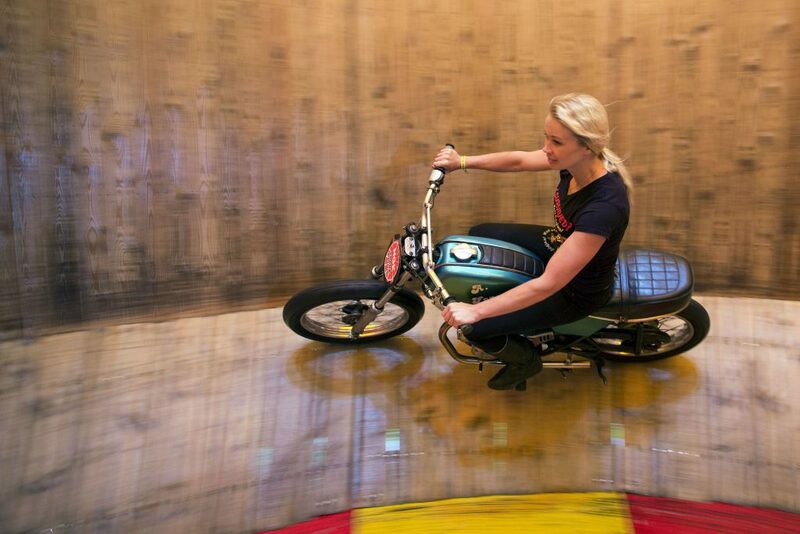 Jaimi Starr, 25, has been getting to grips with the Wall of Death since she was just 17-years-old due to her family background. Jaimi said: “It was family connections that got me into this – because I used to spend a lot of my summer holiday’s practising on the bikes. “I started on the demonstration bike and I just got a great adrenaline rush from it – after that I started to practise on the walls. “Having been a trio with the other girls for the past five years we’ve just got stronger and stronger. “There’s no jealousy and we all help each other along – but we let one another have our own limelight in the wall too. “We have a great bond and although we only ride together once a year, we’re always keeping in touch. “We’re amazing friends, but even more than that they’re like my sisters. “It was great going from such a male dominated team, and being in such a manly industry, to be able to go into the ring as girls and prove that we can do it. Kerri Cameron, 33, accidentally applied for the role when she was looking for a horse rider job at the job centre in 2004. However now, 13 years later, Kerri has never regretted accidentally applying for the job and taking up her new job. 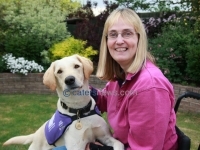 Kerri said: “The Saddle Club where I was working at the time was moving, so I subsequently had to find a new job. “When I typed in ‘horse rider’ the Wall of Death job application came up, but I thought it would be stunt riding on horses! 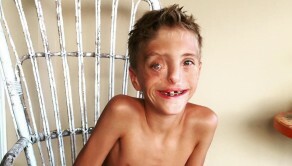 “I spoke to Ken and he told me to come down to the field, and that was it – I was hooked. 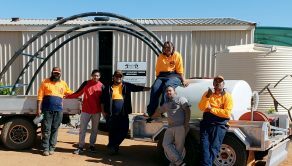 “My first few lessons were boring, I felt like a toddler being pushed around on the demonstration bike in the yard, but then I started on the motorbikes. “For years I was just riding with the boys, so as soon as the opportunity to go into the ring with the other girls came up I grabbed it with both hands. “Everyone who watches always thinks we’re going to be the flash in the centre, which makes it even more empowering and liberating when we get on the bikes and ride. 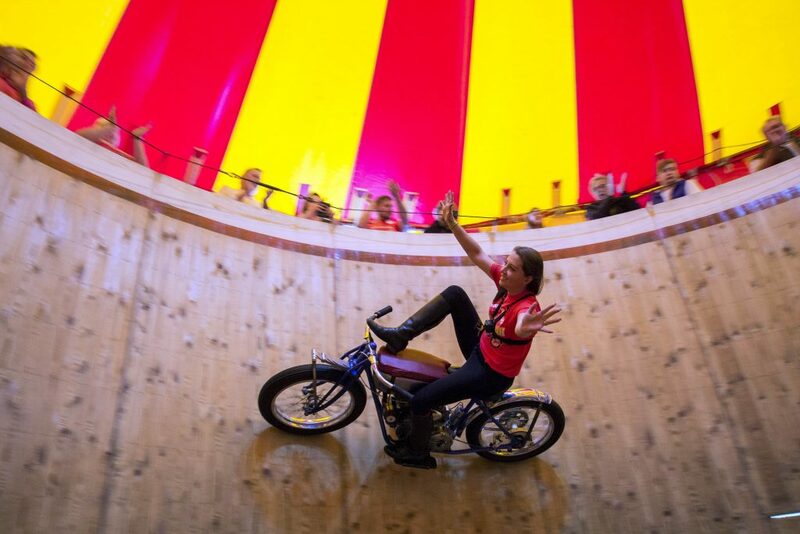 Abigail Fox, 27, joined the Wall of Death after witnessing one of their shows live. After the show Abigail started speaking to Alex, Ken’s son, who was riding in the Wall of Death at the time. 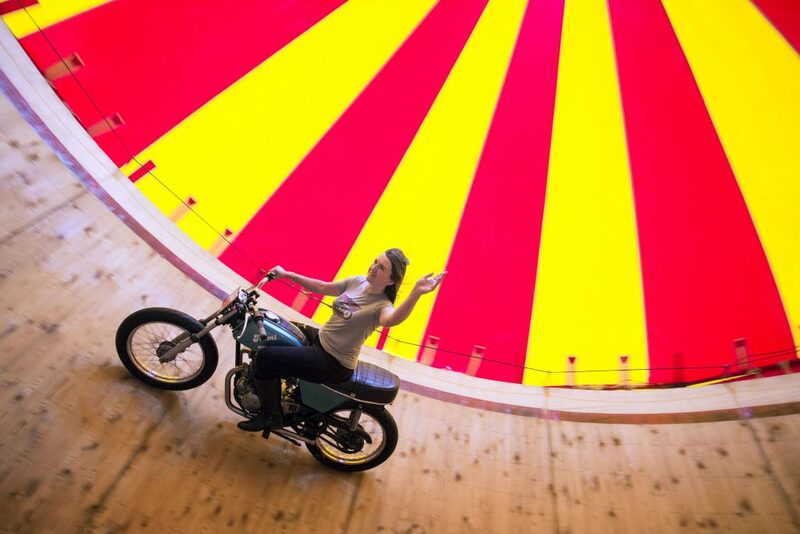 As it was love at first sight, Abigail started to go on tour with the Wall of Death and eventually started riding a year later. Abigail said: “As soon as I met Alex it was love at first sight, after meeting we went on our first date and then I started touring with them. “It took just over a year before I started learning to ride and Alex decided to teach me. “I was so nervous when I first started because I’d never even rode a motorbike before, but the team just started to coach me and I eventually got the hang of it. “Every time that I ride I do still get nervous, but there’s always this great happy feeling as soon as I get down. “I love it when me and the girls all ride together as it just makes it that little bit more special. 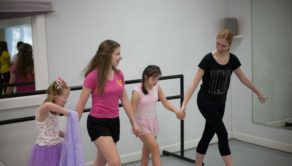 Kids with down syndrome get free ballet classes – and it’s the sweetest thing!